Are you looking at a new SUV? The midsize SUV market is a good place to start. Vehicles like the Ford Edge ST are making a name for the category due to their power and performance. While the non-ST trims are focused on comfort and reliability, the Edge ST likes to do a combination of both, offering up a twin-turbocharged V6 engine that can reach 335 horsepower and 380 pound-torque. 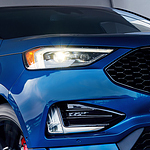 While all of the Ford Edge lineup has been redesigned, it truly feels like the ST contains all of the luxuries and amenities that were meant to be in the base model. You’ll be able to drive to your heart’s content taking advantage of driver assistance features, like lane departure assist and blind spot monitoring. However, you can also accelerate on a dime and get the handling of a small coupe with this upgrade to the Edge. Want to test drive your own Edge ST? We have plenty of models and colors to choose from. You can make your selection at Macdonald Motors.